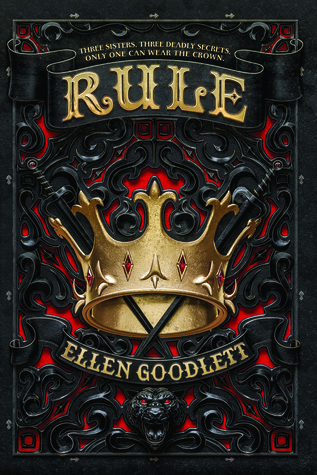 I picked up an ARC of Rule by Ellen Goodlett at San Diego Comic-con. I didn’t know a ton about this book before reading it, but I kept seeing the book on Instagram so I was interested. Stories set in royal courts are really hit or miss for me, and this one was a bit of a miss. Keep reading to find out why! First of all, this book gets a prize for having one of the longest YA synopses I have seen in a while, which is indicative of one of the major problems I had. There are too many characters, and none of them really get their due. I found it frustrating that we had to go through the events of the book 3 times constantly, once for each main character. So much time goes into explaining almost the same thing to each girl, and seeing how they respond. It felt clunky and overly verbose. If you don’t believe in giving people second chances after they do horrible things, this book is probably not for you. You have to be able to invest in people who have murdered, attempted murder, and betrayed their country. I won’t say much more on that front to avoid spoilers, but I found it hard to feel for a couple of characters for that reason. I felt like the bad things that happened were just karma for the horrible things they did. Another thing this book does a lot is relying on the secret keeper trope. Also known as Dumbledoring. Information is withheld from MCs when it could have been offered earlier to help them. It’s always frustrating to me as a plot device, though Rule does address it head-on. Some of the motivations for the secret-keeping were justifiable, so I didn’t hate it as much as I normally do. The secret keeping does lead to one character being abandoned in a super abusive environment, which seemed irresponsible and unnecessary. There are so many unanswered questions about the girls’ lives that are never really addressed because there is a massive cliffhanger. There is also no real discussion of how or when the next queen will be chosen. The plot meanders and can’t focus on a single storyline. For about 150 pages it centers on getting the queen candidates together and starting their training, then the rest of the book barely talks about training or choosing a queen. In order to get answers to anything, you will have to read the next book. I did like some things though, there is an LGBTQ relationship, though I spent a lot of time doubting the sincerity of that relationship. There is a ton of attention to minority groups and their struggles. Almost every main character is a person of color. Those points were very timely and poignant, but somewhat heavy-handed. There were several moments that made me laugh out loud or exclaim, and it takes a lot for a book to get that kind of a reaction out of me. The first half of the book made me think a lot about what kinds of acts I was willing to forgive, and I found that fascinating. If you really get into courtly drama, then I would recommend you give this one a try. If you are like me, and royalty can often lead to royal disappointment, maybe skip this one. Dumbledoring😂 well, I guess we shall see how I get through this one!